Thanks everyone thus far for your input. My dulcimer was signed by a Kevin Johnson. Anyone ever hear of him? I tend to up the string gauges for noter drone playing, particularly for the melody string (I like just one melody string). I like working a heavy melody string with a reasonably stiff pick. There is a volume difference from different string gauges - the key being to match the string gauge to the pitch used at an optimal tension for the string's performance - but that also has to match your playing style. In my opinion, dulcimer string gauges are generally too light. Early instruments would have typically had heavier strings and, when played in noter drone style, would have been quite loud instruments. Switch to a single melody string (0.012 or 0.013 for A), move the (now 3) drones closer together and be particular about your tuning accuracy. DAA A will work OK to start with. DAd A is good for tunes that emphasise the 4th, 2nd or 6th of the scale. EAA A is another great tuning (key of A). Record your playing and listen back to the sound - then think about adjusting the melody to drone balance (pitch and gauge) depending on what you hear in the recordings. 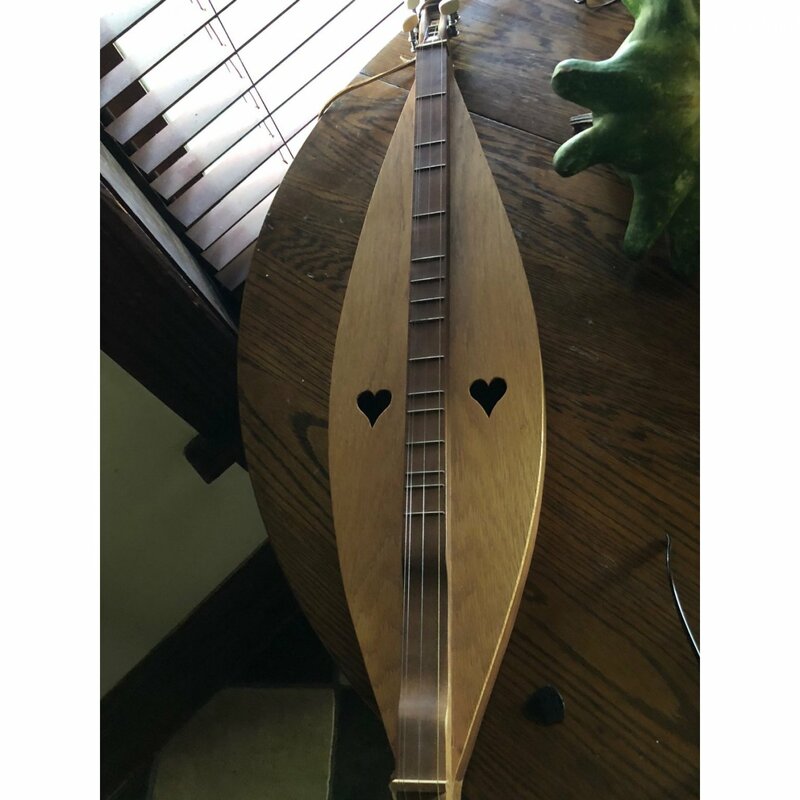 Jimmy -- dulcimer volume is related to the interior volume of the instrument (cubic inches under the hood), square inches of sound hole, and how much the back of the instrument is allowed to vibrate. Search here for information about a "possum board". Think of it as a non-electric amplifier. Dulcimers create their sound a bit differently than a guitar -- the top has that huge brace called a fretboard, and doesn't create a lot of the sound. If the back is allowed to vibrate freely instead of being muffled in your lap, you get a lot more volume. A possum board, or a double backed dulcimer are two ways to get more volume. A possum board can be made for any dulcimer, and some of us build them for sale on request. I built a wooden travel box/case for one of my dulcimers that doubles as a possum board. You can, of course, get an expensive or inexpensive pickup, stick it on/in your dulcimer and play through a mini-amp; but where's the fun in that? Dulcinia, my main noter/drone instrument is one I built based on the C.N. Prichard dulcimer. It is three strings, wood pegs, and a 28" VSL. I use a plain 0.020 and two 0.014s for the middle and melody. Dulcinina -- Unless we have the same VSL, my strings won't necessarily be your strings. Also I rarely anymore tune DAA or DAd; I tune to Bagpipe C -- that is Ccc. Most of my instruments are 27" -- half way between the short and long VSL McSpads. I use 22 ga plain steel (not-wound) for my bass strings, and for the middle and melody c's I use 11ga. I feel that plain steel bass strings give more of the 'high silvery' olde tyme sound that I prefer. If you have a long scale (28+") McSpad in D I would use 20 ga plain steel for the bass and 12 ga for the middle drone and melody. For a short scale (26") McSpad in D I would use the same 20 plain steel bass, but go up to 14 ga for the middle and melody strings. What is it you don't like about the sound? The fact that you're in DAA instead of DAd the change can take some getting used to? Is the sound 'muddy', or harsh? The volume. But I am coming from an acoustic guitar background. To answer your question, the sound is whimpy. But I understand that it’s a more mellow instrument. Take KenH's advice. Just make sure you purchase the appropriate end (either ball or loop) string depending on how they attache to the dulcimer. I couldn't see that in your photo. I'd measure the VSL and check the calculator for the tunings I want to use. If you tune DAA and DAd (switching between the two) you might want a thicker middle string. On my dulcimer with a 27" VSL I use a 0.011 melody, a 0.013 middle, and a phosphor bronze wound 0.024 bass. I use a different set on my strictly noter/drone dulcimer. "Louder" really isn't a function of strings, but rather how firmly you strum, how your dulcimer is constructed, use of a possum board or not, or several other factors. Where do you buy your dulcimer strings? I just purchased a used dulcimer, and I thought a string change would be in order. Are there other considerations that I should be thinking about in terms of gauge or how they are wound? I like my sound to be louder than it is, if that’s possible.